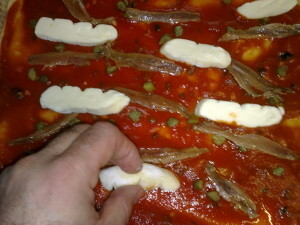 To make this pizza I used the “lievito madre” which is yeast kept under fermentation for long time: often for decades. 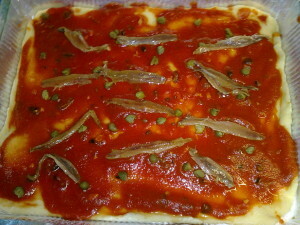 The “lievito madre” is commonly used in the Italian bakeries and few times at home. 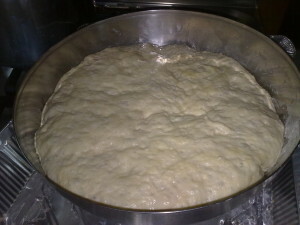 You can use a normal yeast, dry or fresh, no worries. 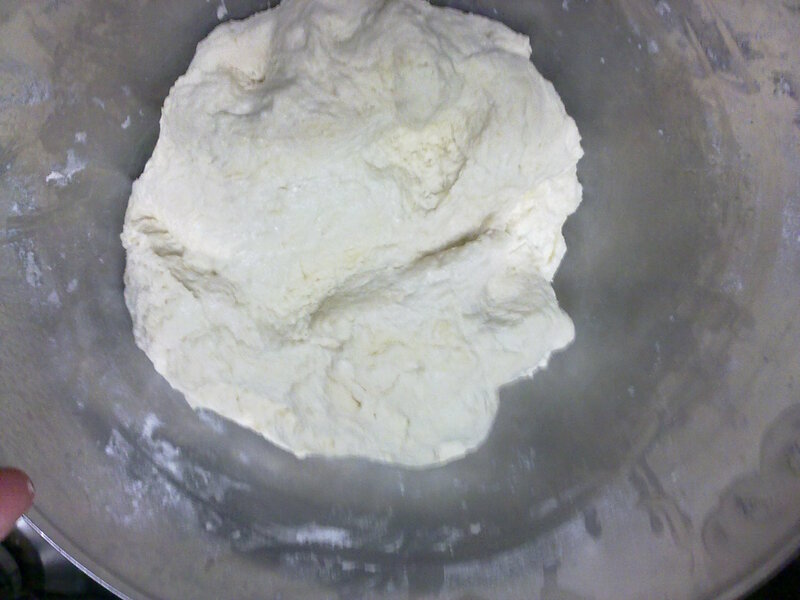 I add 200 grams of “lievito madre” to one pound of flour type “00” manitoba which is the best to make pizza because the consistency of the dough becomes more elastic and it not break while we work it. 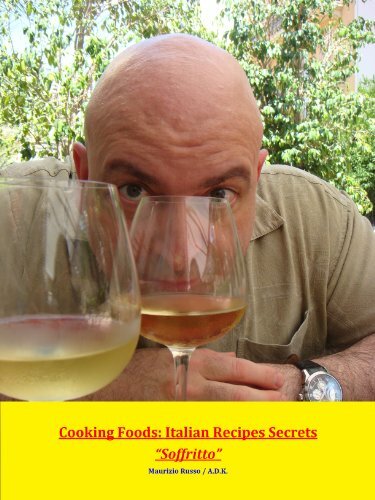 I drop half glass of extra virgin olive oil and three-four pinches of marine salt. 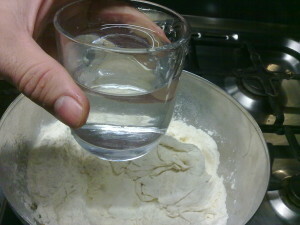 I start to work the dough adding two glasses of water, it takes time to properly incorporate the water in the flour. 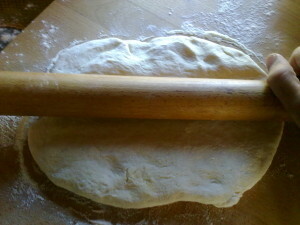 FInally I finish the dough. 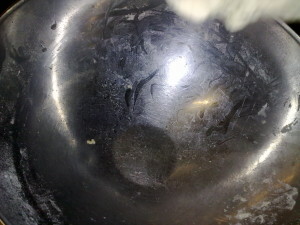 It is ready when it doesn’t stick anymore on the bowl. 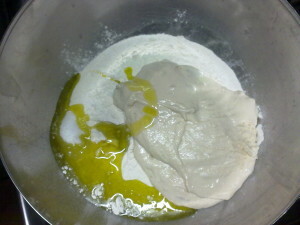 As you see the dough is very soft but compact as I left it leave the bowl with no residual glued on it. The dough needs to rest for a while, between 3 to 12 hours, you can prepare in the evening and keep aside, cover the bowl with a clean dish-cloth but be careful the cloth has not to touch the dough. After the levitation is completed. 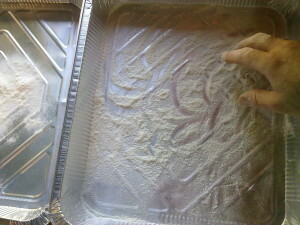 I use aluminum oven pan, spry some flour on the bottom. 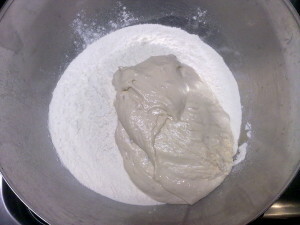 I get a part of dough which I need. 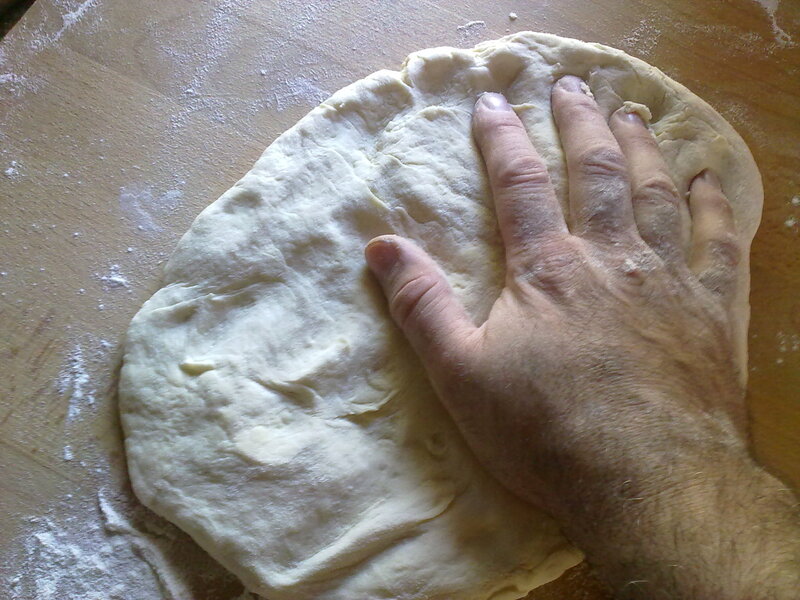 I want a crispy pizza so I go straight to flat the dough: before with my hands. 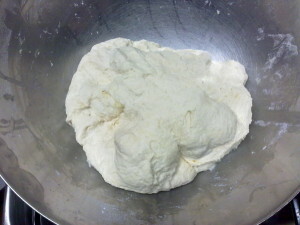 If you want a softer pizza you have to re-work the dough before to make it flat. 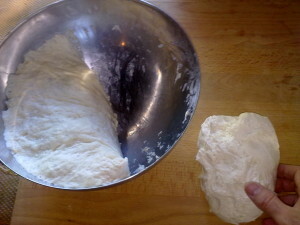 Then I use the “mattarello” to make it flat shaping it to fit in to the oven pan. 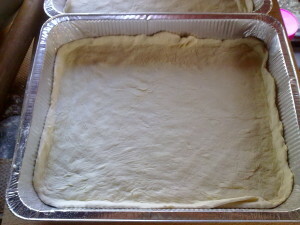 I set the flattened dough in the oven pan, adjusting the border with my fingers. 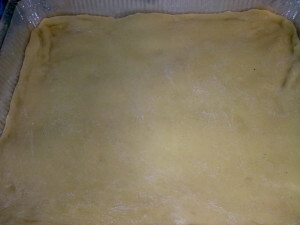 I put in to the oven at 400 Fahrenheit (200 Celsius) to dry up the surface. 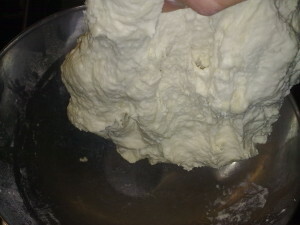 After five minutes is ready and I get it out. 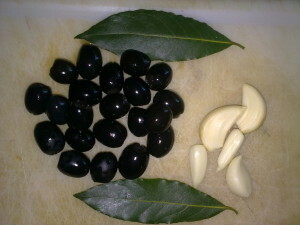 I use just olives, laurel (bay leaves), garlic, extra virgin olive oil, tomato, marine salt. 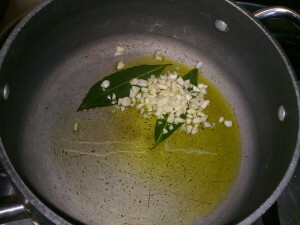 Fry the garlic and laurel in two spoons of extra virgin olive oil. 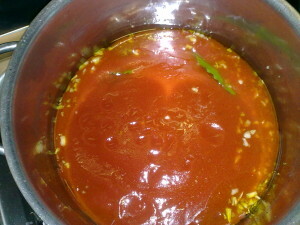 As the garlic starts to bacome yellow add the tomato juice (here it will be one liter in total). 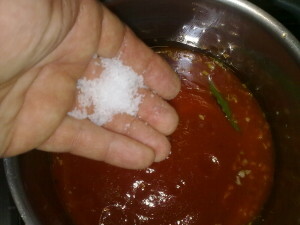 Here I put half of the tomato juice and stir. 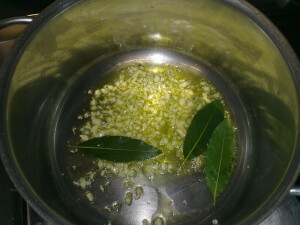 Adding two pinches of marine salt. 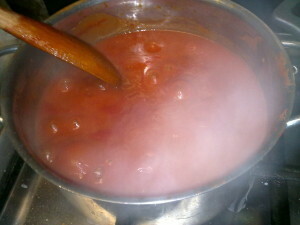 Adding the rest of the tomato juice. 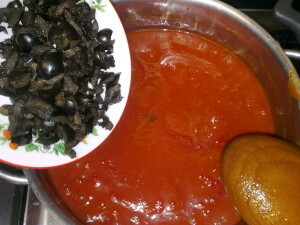 I chopped the olives: drop them in the sauce. Set the sauce to boil, check the salinity. 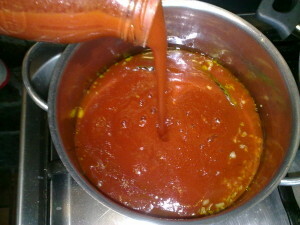 Let the sauce to boil for five to eigh minutes: it is ok now. 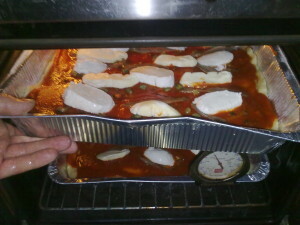 Note that the sauce will cook inside the oven, later on. 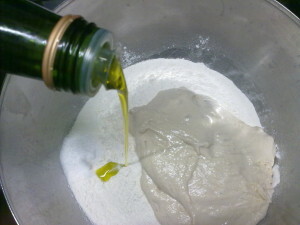 Spread the sauce on top of the partially cooked dough. 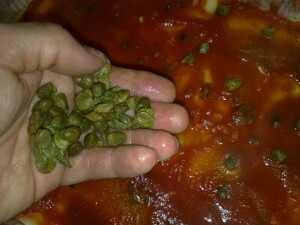 Put some capers here and there. 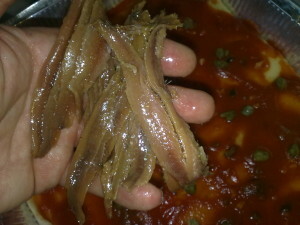 I choose salt anchovies today, you can use ham or pancetta, mushrooms or what you like. If you like oregano or chilly you can add it now. 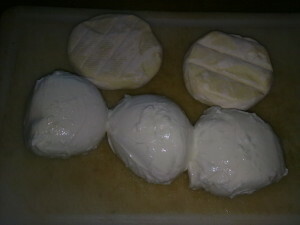 Cheese has to be added: today choice is mozzarella and tomino cheese. 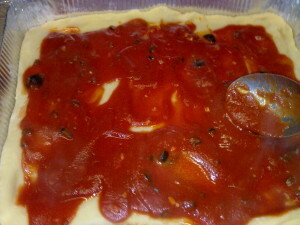 Cut the cheese in pieces. 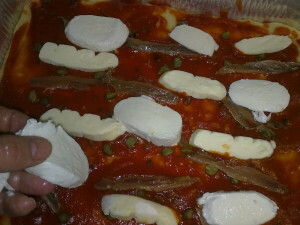 Put on the surface the tomino cheese and mozzarella: you can use any cheese you like. 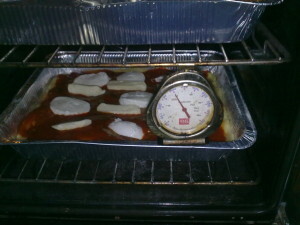 Put in the oven at least at 600 Fahrenheit (300 Celsius). 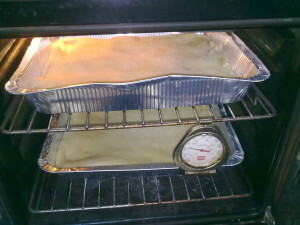 It should be ready in twenty minutes: don’t care about the watch but use your nose as the nice pizza smell come out from the oven check!